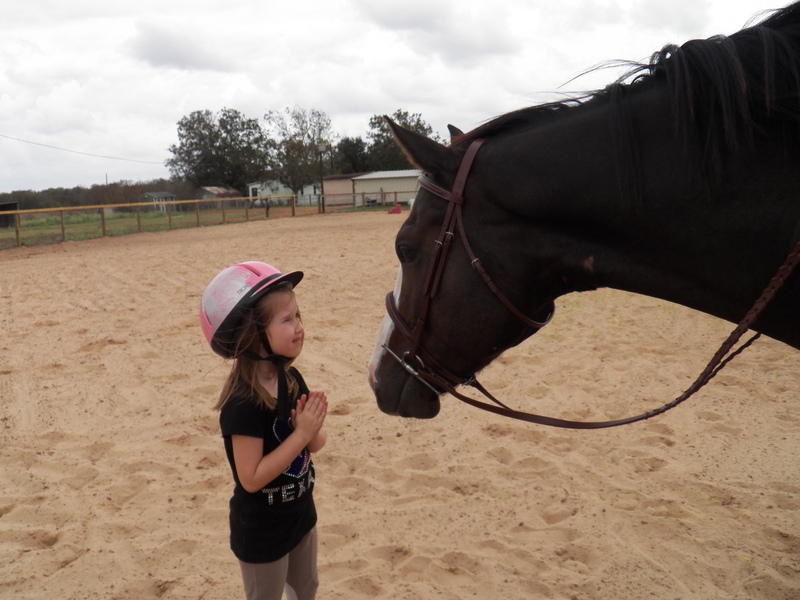 Jordyn sizing up Big Bruno before agreeing to get on.Perhaps she is saying a little prayer too. I have to say I was more than a little disappointed yesterday. But I marvel at God’s timing that he has brought this grand new horse here just when both Lauren and I need to focus somewhere other than on Mickey. Today Ally, Luke, Jordyn and Kendyll met up with Lauren, my mom and I for a little Sunday supper. It was a good day for momma. She liked the place and enjoyed the food. Last night I had found her dressed in the skirt she wore to Amber’s wedding with a tee shirt and tennis shoes on ready to go out. Today she was just happy to be along for the ride. 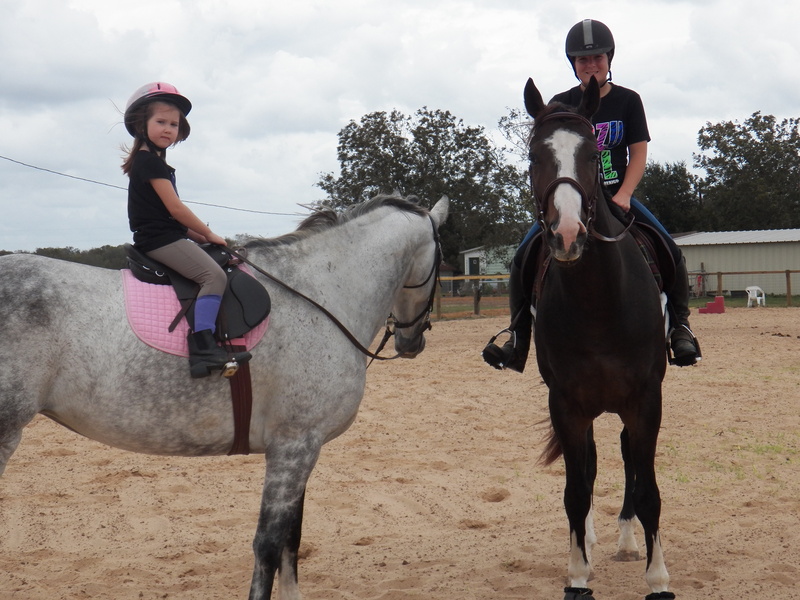 Jordyn decided to go back to Granny’s house to get a peek at the new horse. Now, remember we got him sight unseen. We have never saddled him, never ridden him and have no idea what he might do. He has a healing hoof so he is limited to slow work. We got Jordyn saddled and up on Feather and Lauren climbed in the irons on the broad back of Bruno for the very first time. It was like Christmas around here. Two beautiful five-year old horses with so much ahead of them and one five-year old girl who wants to be part of it all. Gets your perspective back, it does! Five-year old Jordyn on five-year old Feather facing not five-year Lauren on five-year Bruno. It certainly brought the reality back to me that life is what we make it. Perhaps Mickey is retired. Perhaps he will win classes in the future. We did all we could for him. It was not enough for Jordyn to take a spin on Feather. She wanted to ride “Big Bruno”. So we changed saddles and let them go. He was wonderful with her. To borrow from one of my fellow bloggers-I am overjoyed with gratitude. Thanks for riding along, caring, praying and being a part of our journey. I am grateful for many things. 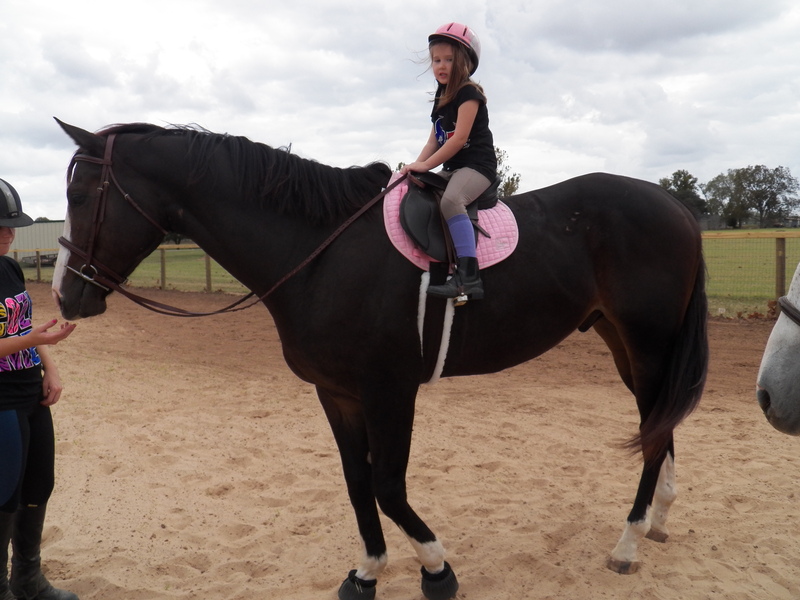 This entry was posted in Grandkids, Horses and tagged children riding, OTTB by Exechorseluver. Bookmark the permalink.